Bladder tanks are pressure vessels with a double volume. A special foam concentrate storage membrane separates the foam concentrate from the ﬁreﬁghting water. Level measurement is made by draining the water between the membrane and the tank walls, air must be evacuated can be found in over the liquid levels for both water and foam concentrate sides. C.S.I. S.r.l. uses ﬂow meters at the foam concentrate line before it enters the mixer, counts consumed liquid in liters simultaneously enabling the user to read the consumed and remaining foam concentrate quantity from its display or from the remote computer connected to the multiple communication options. According to EN 13565-2, a foam proportioning accuracy test should be performed annually to ensure the equipment's functionality at the minimum and the maximum ﬂow rates needed by the foam extinguishing system. The standard also advises using environmentally compatible foam substitutes. C.S.I. S.r.l. creates a “white test circuit” enabling the user to make functional tests of the proportioner without using foam concentrate and polluting the environment, thanks to the isolation valves cutting connections of the mixer from bladder tank. 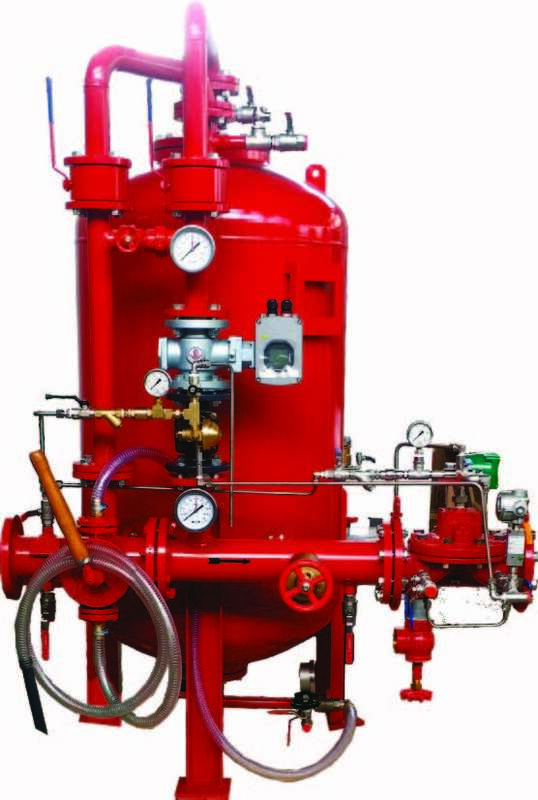 The ﬁreﬁghting water enters to mixer transmitted to foam concentrate line via the by-pass circuit and is proportioned according to the ﬂow rate while the water quantity passing through is measured by the ﬂow meter. C.S.I. s.r.l, provides hydraulically actuated foam concentrate isolation valves, with special HALAR® coating to guarantee the maximum resistance against corrosion eﬀect of the foam concentrate. These valves have the function to cut oﬀ the eventual ﬂow of the foam concentrate to the line and open only when the pressurized water enters the mixer. Bladder tanks, may be kept under pressure by using a cut oﬀ valve after mixer, or kept at atmospheric pressure by using a cut oﬀ valve before the mixer. Particular attention should be paid, to guarantee the values of the residual pressures in the upstream piping which feeds the system to have lower than design pressure in the bladder tank.